Sure enough I went back to look at Abby's shirt.... I had actually misspelled her name... yea.... mommy fail! I guess that's why I should keep my crafting to nap and post-bedtime or while Daddy takes the kids to the gym and not while they are awake. For once I'm glad that the vinyl heat transfer was able to peel up. This shirt had been washed several times and the heat transfer still looked beautiful (which I was really worried about how it would hold up since the printable kind does not hold up well at all!) 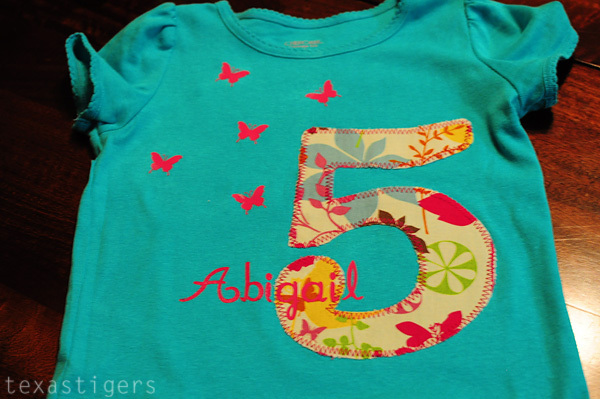 but I was able to get my little hook tool underneath and peel up the i and a in Abigail. This did make me love how easy to use the Silhouette is as well. Within maybe 15 minutes I was able to pull out the Silhouette machine, a scrap of heat transfer I had already cut from take one with this shirt, open my file I used for the shirt and cut out a new i and a and ironed them on. Voila - her shirt with a correctly spelled name. So happy I was able to fix my mistake. I would have been super sad if it had to stay with her name misspelled. So anyone have any stories to make me feel less silly/bad about misspelling my daughter's name? I can't believe we didn't catch the booboo! I suppose it is the phenomenon of seeing what you expect to see! It looked great before- now it looks perfect!